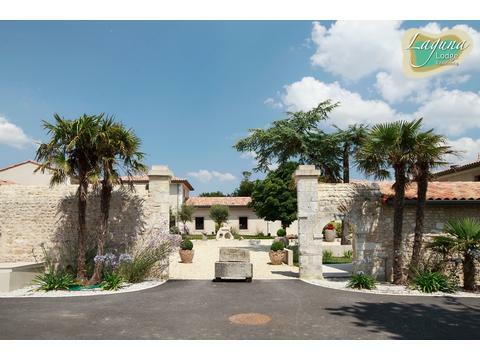 Laguna Lodge is a residence with 10 luxurious villas situated in Saint-Just-Luzac, in the heart of the Charente-Maritime region, on the Atlantic coast of France. Our residence is located near l'Île d'Oléron, between La Rochelle, Royan and near Rochefort and Saintes. Only the old stone walls remember of the anciant farm from 1662 which has been completely transformed into a new complex of 10 spacious and comfortable holiday villas, which can accommodate from 3 to 8 people. Each accommodation is fully equipped and differently decorated in a modern balinese style with massif wodden furnitures and marble floors in the shower rooms, livings and kitchen. Each villa has a beautiful view over the meadow and the protected area Natura 2000 where lots of migratory birds found their refuge. In all the accommodation, you will find a television, a fully equipped kitchen with oven and dish washer. 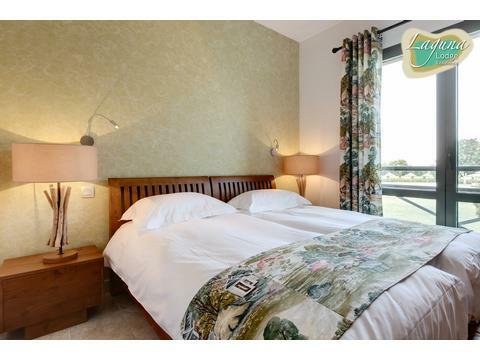 There are bed linen and towels included in all the appartments as free Wi-Fi. They all have a terrace with garden furniture, barbecue, sunbeds and parasol. You will also find, in each villa, a baby cot and an infant chair. There is a 1.000 m² natural pool in the form of a lagoon in the heart of the residence where you could enjoy the sunny weather of the Charente-Maritime region. The lagoon is surrounded by a white sandy beach and comfortable Balinese pavilions and 10 parasols in which you can relax. The gentle slope of the lagoons beach is perfect for children to play and the deeper part of 1.50m provides you to do some laps. In the residence, you will also find a small children's playground with swings and a little house with slide. There is also a vegetable garden with vegetables, fruits and aromatic herbs. On spot, there is also a room with a washing machine (washing powder already incuded), a dryer and ironing facilities, free of use. Finally, on the residence, there are 8 bicycles free of use for all the residents. Other bicycles can be rented at our 5 star campsite Séquoia Parc. By being a resident of Laguna Lodge, you have free access to our 5 star campsite Séquoia parc, located at only 3 km from the residence. There, you could enjoy, for free: the aquapark of 2.000 m² with 4 pools of which 3 are heated, slides, fontains and a lazy river, but also, children playgrounds, the mini animal farm, the sport fields, the entertainment and the free kids club for children from 4 to 12 years old. With an additional fee you can also find at campsite Séquoia Parc: an equestrian centre (July/August), bar/restaurant, the new wellness centre "Les Brises Wellness & Fitness" with covered pool, sauna, hammam, Jacuzzi, massage cabins, tisanerie, fitness area (free), solarium of 300 m² on the rooftop (free). There is also on the campsite a souvenir shop, tennis court (free in low season) and a mini supermarket. Laguna Lodge is open from 27.04.19 to 29.09.19, so you could also visit us in spring and autumn to discover our beautiful region thanks to the wonderful climate in the region. We would be very glad to welcoming you very soon at Laguna Lodge Résidence. Laguna Lodge is situated on the Atlantic Coast of France, near l'Île d'Oléron. In the region, you can find many beautiful beaches and visit cities like: Royan, Rochefort, La Rochelle, Ronce-les-Bains, Saintes, Île de Ré or Aquarium La Rochelle.. Contact Laguna Lodge Residence for Enquiries and Availability.